Sure, it’s easy to choose how far and wide to share your latest Facebook updates and photos; all you have to do is pick an option (like “Public,” “Friends,” or “Only Me”) from a nearby pull-down menu. But what about all those other photos, videos, and updates you’ve posted on Facebook over the years? Lost track of who you’re sharing them with? You’re not the only one. Well, one (rather tedious) option is to retrace your steps, checking each and every post on your profile to see who you shared them with; just hover over a post with your mouse and check out the icon that appears to the right. A pair of silhouetted heads means a post is shared with your friends only, while a gear icon represents a custom sharing setting (for, say, a few selected friends, or your friends plus all their friends). A little globe means … well, everyone. Want to make a change? Click the icon to select a new setting. If you’d rather not cull through dozens or even hundreds of old posts, there’s an easy—if somewhat drastic—way to lock them down all at once, so only those on your Friends list can see them. The process takes just a few clicks, but as Facebook warns, there’s no way to undo it—shy of going back and changing the sharing settings for each post by hand, of course. Also, keep in mind that any specific Facebook users tagged in your posted photos or content will still be able to see those specific posts—and their friends (including non-mutual ones) may have access to those posts, too. 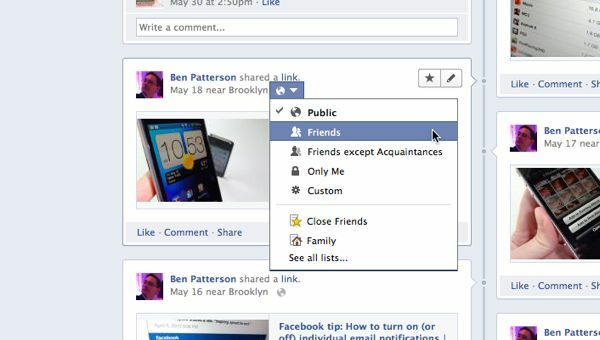 Clicking a single button will change the privacy settings for all your old Facebook posts at once. Click the little downward arrow in the upper-right corner of any Facebook page, then select “Privacy Settings” from the drop-down menu. Near the bottom of the page, find the heading that reads “Limit the Audience for Past Posts,” then click the “Manage Past Post Visibility” link right next to it. Sure you’re ready to proceed? If so, click the “Limit Old Posts” button. And with that, clang! Now all your old wall posts are restricted to your Facebook friends and any specifically tagged Facebook users. Note: This revised and updated article was first published in September 2011.